No. 1 Tee - Southern Descent, the 554-yard par five, is where the action starts. 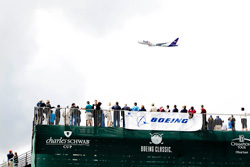 This is the perfect place to watch the Boeing flyover on Friday. No. 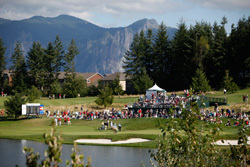 9 Green - A short walk from the entry gate of the Boeing Classic is the ninth green. The hole, known as Screaming Eagle, is a 207-yard par three with carry over water and bunkers. Bleachers reside high above the green for great viewing, comfortable seating complete with a sundeck and a bar for cold beverages. No. 10 Tee - Next to the green at No. 9 is the 10th tee box, also with bleacher seating. This 353-yard uphill layout allows fans to view players as they tee off and take on their tricky approach shots. With double tee times on holes one and 10, this is a great place to catch the action. Be sure to grab a burger and beer at the 19th Hole located adjacent to the 10th tee box. No. 13 Green to No. 14 Tee - A great place to catch a bevy of action within a short distance is between the 13th green and 14th tee box. The par three, 13th is called Mt. Si-gh and deservedly so with spectacular vistas from all along the 210-yard hole. No. 14, Bear's Canyon, is the signature hole for the Jack Nicklaus designed course. 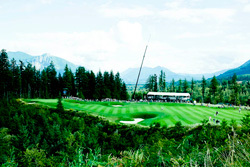 With an upgraded ticket into the Canyon Club (available at admissions gate or Canyon Club entrance) located on the 14th green- you'll have a great view of the green, as well as the 18th tee box with a drink and snack in your hand. No. 14 Green to No. 17 Green - This 448-yard, horseshoe-shaped par four drops 80 vertical feet in elevation from tee to green and can be dramatically shortened with a risky tee shot over the canyon. A short, easy downhill walk to the green at 17 can provide a great place to see late-round drama unfold. The 211-yard par three is a carry over water with a two-tiered green guarded at the front by an immense rock. No. 18 - The crowd funnels together late in the afternoon all along the dramatic par five. With hospitality and corporate seating on either side of the fairway and natural hillside seating behind the green, the stage is set for spectacular viewing of the finishing hole. 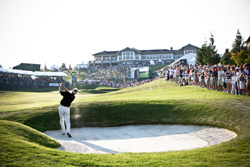 The scene that is offered for fans sitting on the hill just below the club house was voted as the PGA TOUR's Champions "Best View from the Clubhouse". A large 15' x 35' video board keeps fans in tune with what is happening across the course.